Searching for Rainbows in our Storms. 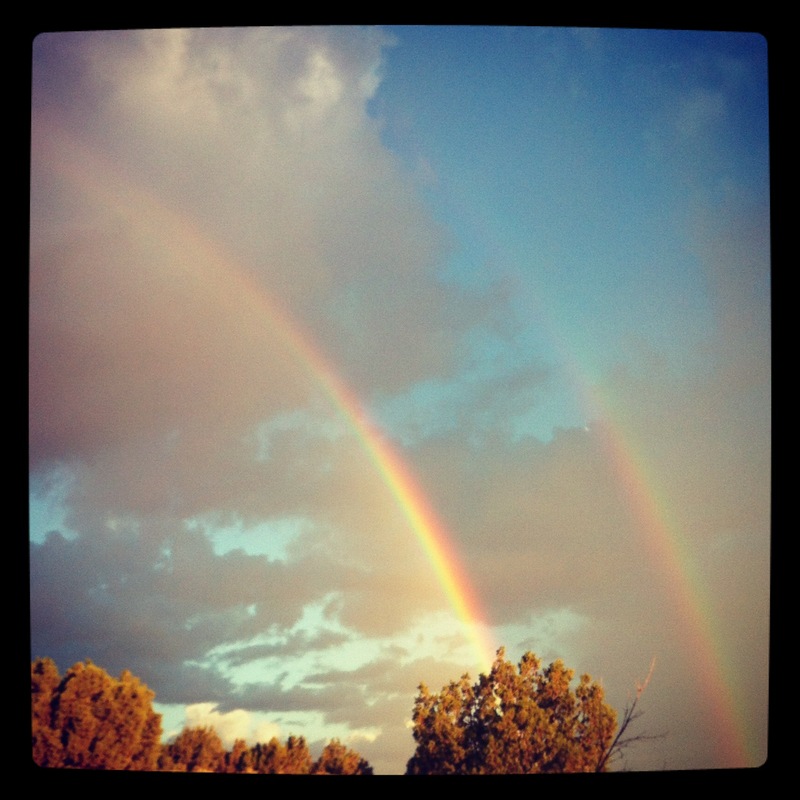 God’s gift of two rainbows in my front yard are a reminder of His promises to us. I have walked through some small rain storms in my days, as I’m sure you have, but I have also bunkered down in some crazy tornado storms that tried to rip me apart, storms that tore at my family, my relationships, my faith, and my self worth; the unbelievable kind of storms that leave you stunned, asking “what just happened”. Perhaps you intimately know these kinds of storms as well? They are defining, they make you dig deep and choose what you are going to believe as truth in your life. For me personally, it comes down to my faith; the personal promises of God’s Word, that He loves me, that He will never abandon me, that He will never forsake me, that He will protect me, that His grace is sufficient in my weakness. Ah, even writing those promises brings a peace over my heart and the tension from my current battles are lightened. If I’m honest, I would vulnerably tell you that the past few months have been brutally painful for me. That the bitter sting of family betrayals and the hurtful decisions of others seized my heart and threw me into a depression and a state of fear and pity like I have never known. I questioned every thought and decision I had every made, I questioned my self worth, and my faith. My sadness and pain felt like a darkness around me that was so thick, I could not feel Jesus anymore. The encouragement of loving friends and family fell to the floor of my darkness and disbelief. I became a bitter, short tempered crying mess, and my husband and children suffered the most. I’m so very sad for that. But, the good news is God is faithful to restore his beloved sons and daughters. I’ve had some dark days of self-doubt in my life but, my sweet Jesus came through my darkness with a fire, an amazing refining fire, filled with hope, and love, and best of all JOY! I thank my closest prayer warrior friends for standing beside me and lifting me up in prayer when I could no longer bear to stand alone. Your are treasures! Here is the biggest beauty that came out of my recent struggles; joy and hope are found in thankfulness. Jesus never promised us an easy, problem free life – he promised us eternal life; found through his death on the cross, and that gives us reason to rejoice and hold to the hope found in Him.